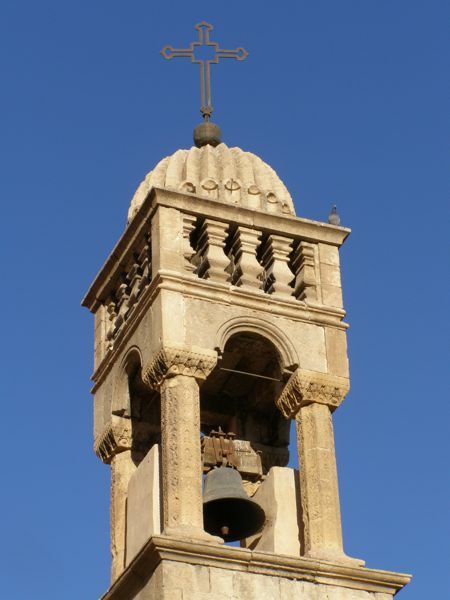 Rather than bore you with the history of its picturesque churches, museums, monasteries, medreses (Islamic religious schools) and homes—oh, and the most stunning post office on the planet, I want to write about the people we met. First off, Dee sat next to a Turkish woman (a physicist) on the plane who offered to help us organize a taxi into the city of Dıyarbakır. 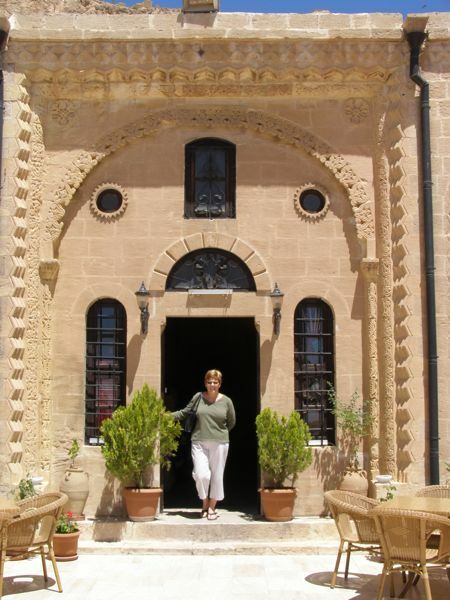 Once she had negotiated a fair price, she waited as we climbed in, then offered to ride along and help us find the bus to Mardin. “Oh, heavens! You don’t need to do that,” Dee said. “We’ll be fine, but thanks anyway,” I added. She hopped into the cab, assuring us that she had nothing better to do. (Right.) 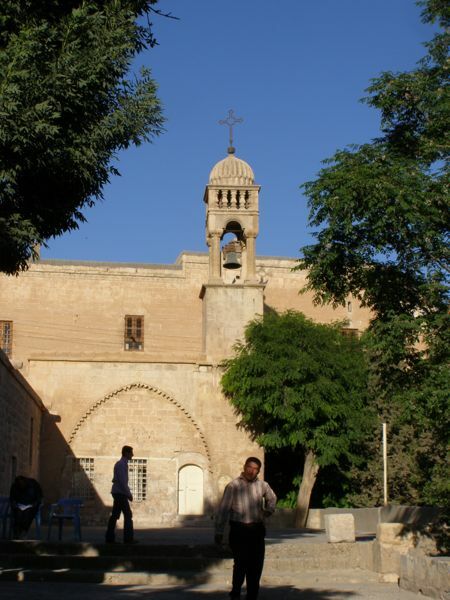 We soon arrived at the “bus station”—a round, low building surrounded by an empty concrete courtyard. Two young boys scurried up to our taxi with a battered wheelbarrow and immediately piled our luggage into it. The taxi driver seemed fine with it, and our friend shrugged. The boys wouldn’t let me take their photo (bummer), but got right down to business leading us to our bus. It turned out that the inside of the semi-circle otogar (bus station) was lined with white mini-busses, like the service busses used in Istanbul. Our friend waited until our bus arrived, then made sure the driver understood where we were going and charged us the right amount. After a flurry of thank-you’s, cheek-kisses, and goodbye’s, we climbed aboard and she headed off. Talk about Turkish hospitality! We sat with a rural woman and her 10-year-old daughter. They tried to chat with us, but we unfortunately understood little of what they said. (Our conversational Turkish is more than limited.) She proffered a piece of chewing gum, something like a tiny white eraser. We gnawed away at it, smiling and nodding amiably, unsure how long our jaws could take it. Amazingly, the gum developed a hint of mint flavor after about a half hour. It never softened, though, and I finally saw Dee surreptitiously spit hers into a Kleenex. I swallowed mine. A decorated window on a back street–probably to a churchyard? The bus driver stopped near old Mardin (where our hotel was), then waited with us until the city bus arrived. He told the bus attendant the name of our hotel, and we were on our way. A smiling man seated in front of us gave me his card, Sevgi Taksi, offering to take us on a tour of the city the next day. Yesür was a paunchy fellow dressed in denim (both obesity and denim are rare in Turkey). 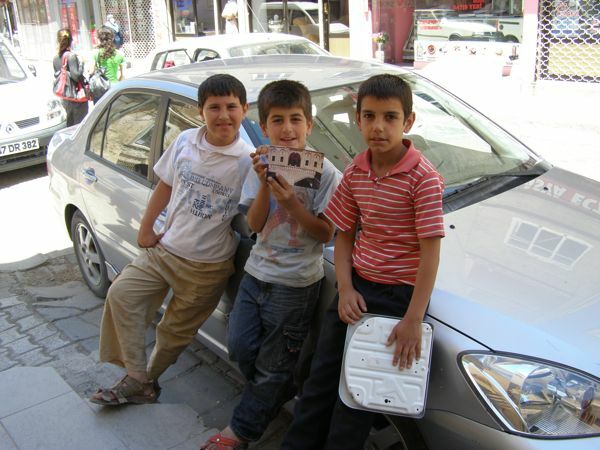 When he picked us up the next day, he presented us each with a map, a guidebook, and a CD on Mardin. All in Turkish, but still helpful. How kind! 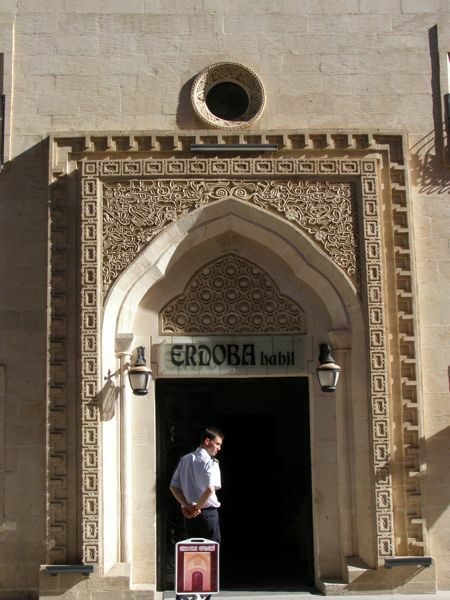 Dee in the Erdoba Hotel terrace entrance. We also met a lovely restauranteur who fawned over us in his pristine little locanta. We enjoyed a lovely meal of fresh hot pita bread, salad (which he replenished twice), chicken shish, ayran (a yogurt drink) in copper cups, and tea. 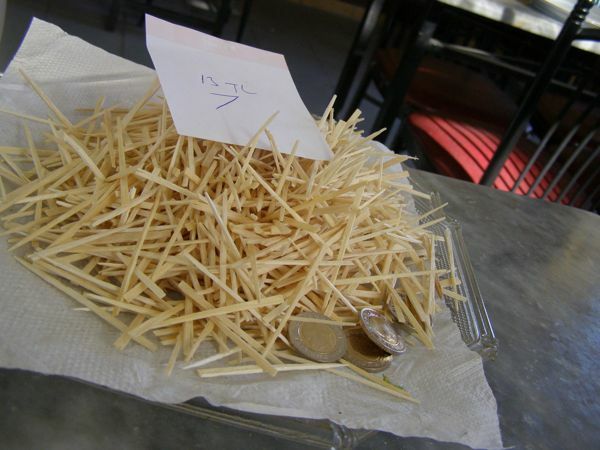 He brought us our bill on a mountain of handmade toothicks—a total of 13 lira. That’s about $4.00 each. Wow. That first evening Dee discovered a striking stone necklace, and as she purchased it, the jeweler asked if we’d like something to drink. “Tea, water, Turkish coffee?” he asked. “We’d actually prefer some wine,” I quipped. We’d watched for a liquor store, but to no avail. 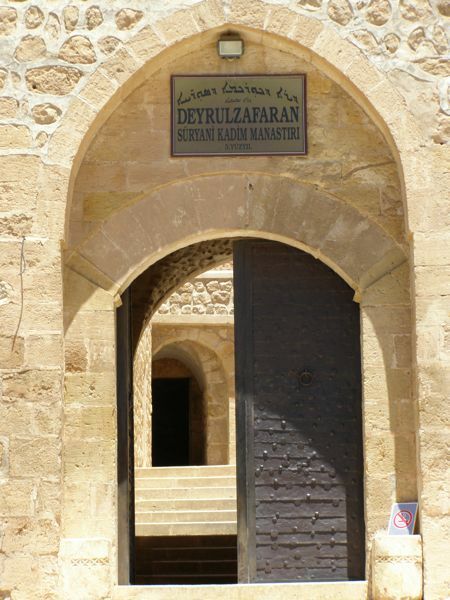 Mardin is dry. 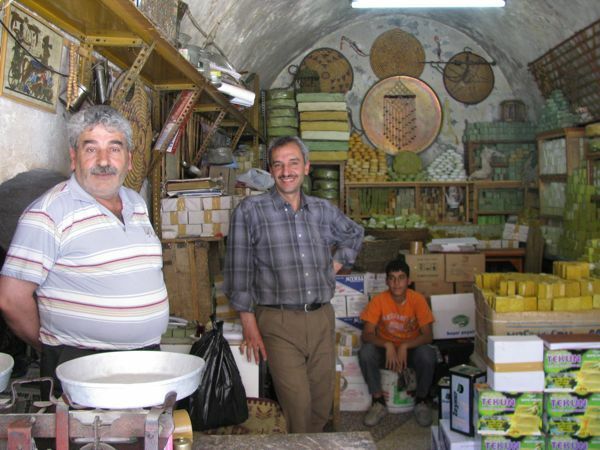 Amazingly, he reached under the counter and pulled out a bottle of Mardin’s own red wine. Go figure! He happily sold it to us, and we even-more-happily brought it back to our hotel and indulged in our evening vice (with pistachios). 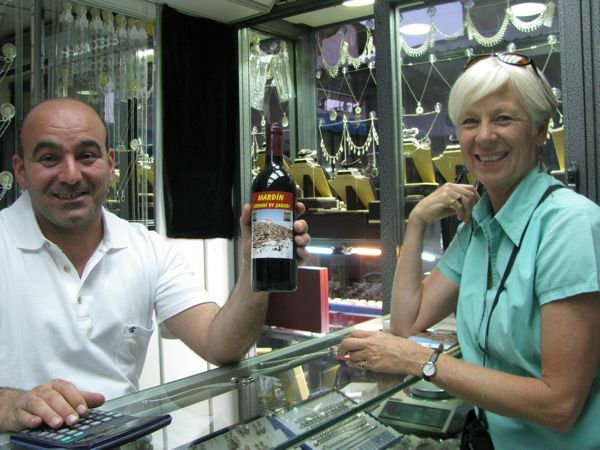 Buying wine from the Jovial Jeweler! The most interesting person we met was a man who “guided” us through the Deyrulzafaran Monastery (think saffron) just outside of town. There were no English guides available, but this man showed us the ancient Sun Temple, the larger Sun Church, and an upstairs chapel. He said there’s only one monk in the monastery right now, a Swede; then he shared that he is living there as well. 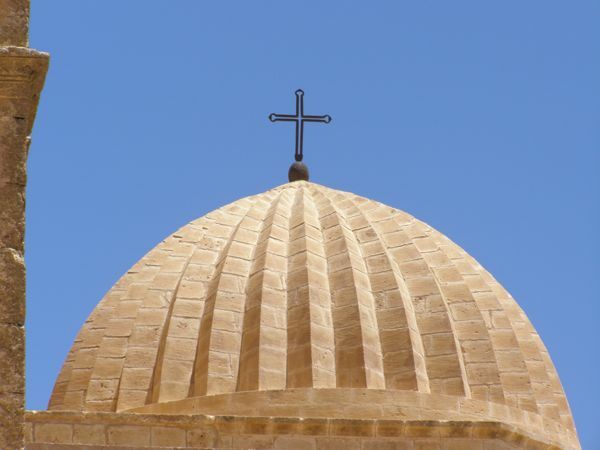 Actually, he’s an Iraqi Christian who’s fled his home because Christians are being persecuted in Iraq. Unfortunately, Christianity is associated with America, and Christians are being summarily executed. 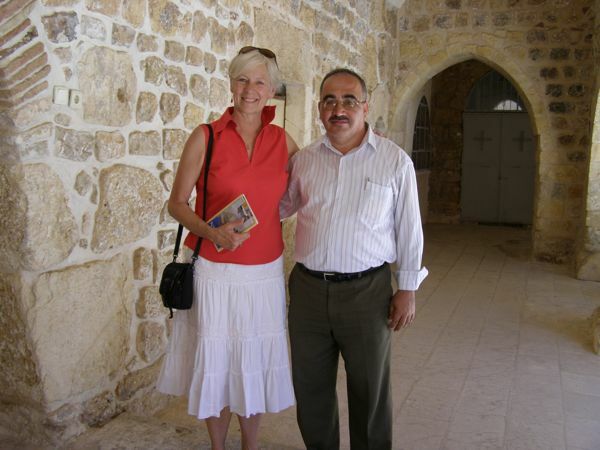 He’s found refuge in the monastery with his wife (a PhD in English), his young children, and his parents (retired teachers). He told us that although most Iraqis once loved America, “Now it’s different. 99 percent of Iraqis hate the American government for what it’s done to our country. I can go to America to continue my career as an engineer, but how could I live in the country that has destroyed mine?” He’s hoping to emigrate to Australia, otherwise he will take his family to Canada. Of course, he’d prefer to go back to his beautiful home in Iraq, which he will probably never see again. It broke my heart to hear him say that he doesn’t think Obama will change anything. I like to think he’s wrong. 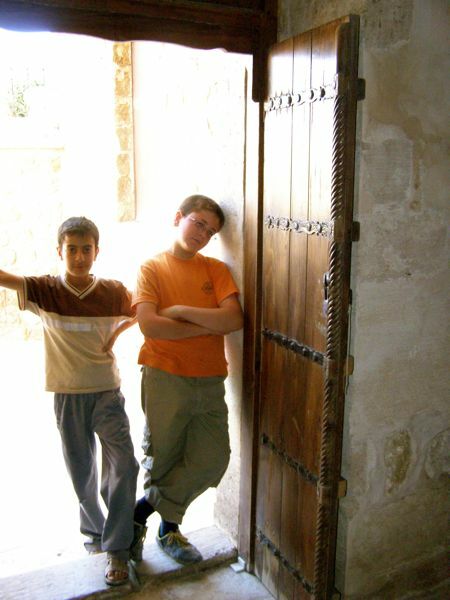 Our favorites, though, were the little boys, our unofficial guides. On our first night exploring the city, a 6-year-old boy led us up to the beautiful Zinciriye (shackle) Medresi which was unfortunately closed. Sigh… Of course, we’d already seen a museum, an ancient church, and many lovely homes with their ornately carved fronts, so we weren’t too upset. 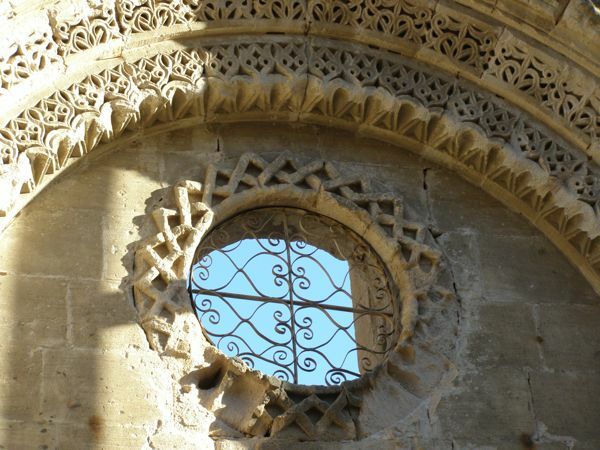 All the buildings in old Mardin are made of limestone, and many have ornate Moorish-like designs carved around cornices, doors, and windows. It’s gorgeous. The little fellow in the middle was our first “boy guide”. 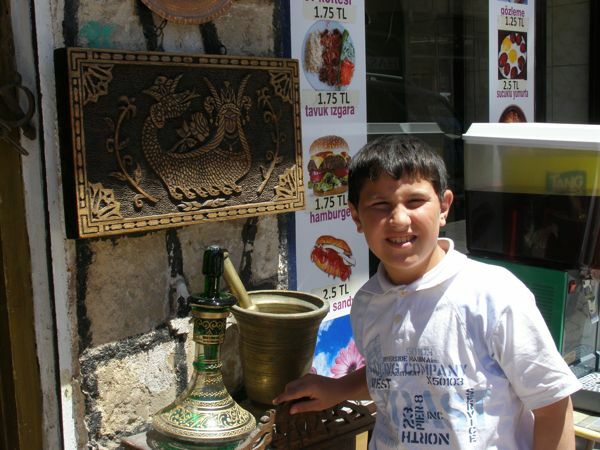 At any rate, another little boy named Yusuf (about 10) befriended us at the medrese. He offered to take us to more mosques, but we were just too darned tired. We ran into him at least four or five more times over the weekend, and he’d always tag along with us, chatting us up as best he could. I think he had tourist radar, but we grew very fond of our little buddy. On Saturday he hauled around a bathroom scale all day to earn money for his family (like I’d PAY for that bad news—in public, no less). Saturday afternoon we decided to walk a loop of back streets and were once again befriended by little boys. What is it about older women, I wonder, that we attract these kids? They were excited to show us the sights, though, and they were far more useful than our maps. 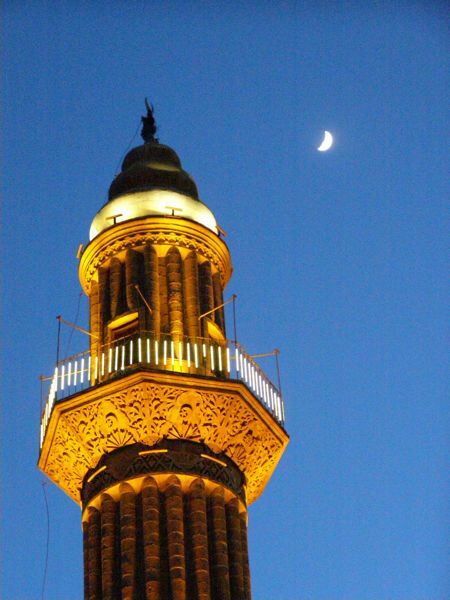 They led us into mosques, medreses, and hotels—chatting away in Turkish, some of which we could understand. They were very polite, and equally pleased to show off their neighborhood. 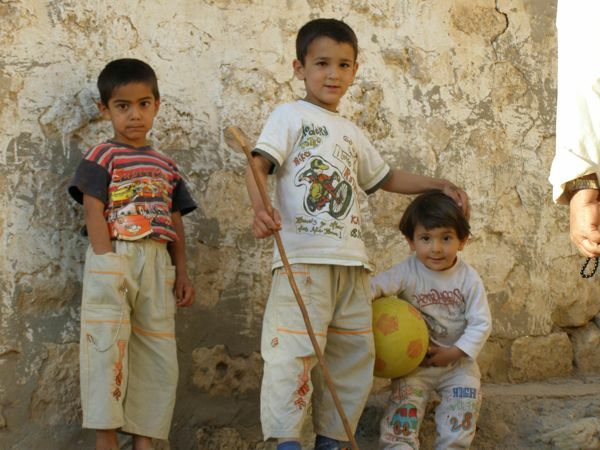 The quieter, thinner one was named Onur, and the stockier boy had a fascinating name: Savaş Barış (War Peace). I think of him as the Oxymoron Kid. On our way to dinner that night, we ran into our little friend Yusuf once again, still carrying his scale. He offered to guide us, but we only wanted dinner. Though we refused to get on the scale, we gave him some lira for just being a good kid. 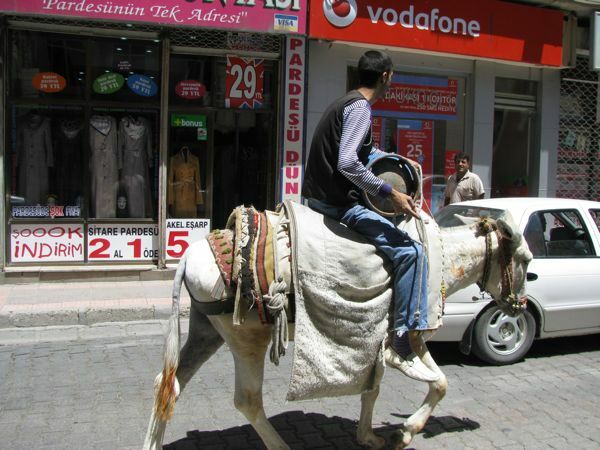 And how we loved the “eşek”–donkeys, always working hard! 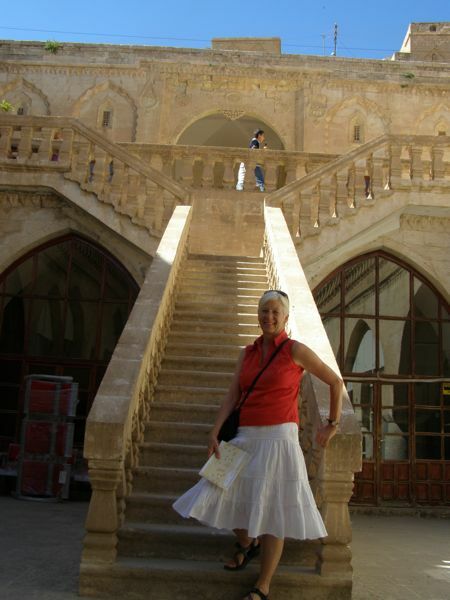 So—Mardin is, indeed, a magical place. The buildings are incredible, but even more importantly, the people are delightful. Turkey continues to impress me; the generous warmth of its people puts “Minnesota Nice” to shame. Oh—by the way, Yakub found us just as we were waiting for our cab to the airport. What a sweet kid.